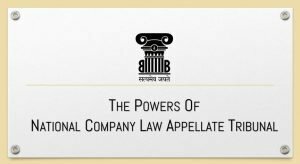 The Power of NCLAT in Appeal - B&B Associates LLP. To govern the mismanagement or functioning of companies the government set up National Company Law Tribunal (NCLT) and National Company Law Appellate Tribunal (NCLAT). The NCLT is a quasi-judicial body that deals with matters arising between companies and the National Company Law Appellate Tribunal (NCLAT) are an appellate board where an appeal is preferred against the orders of NCLT if the parties are not satisfied with the judgment of the NCLT. It is mentioned under Section 410 of the Companies Act, 2013. Let’s try to understand the appellate Powers of National Company Law Appellate Tribunal (NCLAT). On 1st June 2016, the Ministry of Corporate Affairs notified about the constitution of NCLT, i.e. National Company Law Tribunal and NCALT, i.e. National Company Law Appellate Tribunal under Section 408, and 410 of the Companies Act respectively. The notifications regarding these tribunals were in abeyance for 14 years, and it was first introduced in 2002 by recommendation from Eradi Committee. The scope of NCLT is to deal matters arising between the companies, and NCLAT is to deal with the appeal against the order of NCLT. The NCLT also deals with the IBC, i.e. the insolvency and bankruptcy code and NCLAT deals with the appeals against the orders passed by the insolvency and bankruptcy board. The Appellate Tribunal has the power to control its procedure, and the Code of Civil Procedure Code doesn’t decide the course of conduct followed by the Tribunal as the Tribunal is bound by the principles of natural justice, subject to the other provisions of the Act and of any rules that are made by the Central Government. Furthermore, no civil court has the jurisdiction to decide any suit or proceeding concerning any matter which the Appellate Tribunal is empowered to determine. Rule 11 of the NCLAT Rules, 2016 provide that, “Nothing in these rules shall be deemed to limit or otherwise affect the inherent powers of the Appellate Tribunal to make such orders or give such directions as may be necessary for meeting the ends of justice or to prevent abuse of the process of the Appellate Tribunal.” These inherent powers assert equity as an essential part of the Tribunal. The Appellate Tribunal refused to settle the case post-admission. The Supreme Court, in this case, was faced with the question as to whether NCLAT could utilize its inherent powers recognized by Rule 11 of the NCLAT Rules, 2016 to allow a compromise in a matter where an application for insolvency resolution has been accepted. The Apex Court(without extensively dealing with the said question on merits) ruled that the Appellate Tribunal stood correctly in not exercising its inherent powers under the Rule above 11 to record consent terms of the parties after the Application for Insolvency resolution was admitted. However, the Hon’ble Court put a quietus to the matter by taking consent terms on record utilizing Article 142 of Constitution of India. M/s B Himmatlal Aggarwal v Competition Commission of India. A significant fine was imposed on the appellant as he was found guilty of bid rigging by CCI, i.e. the Competition Commission of India for floating tenders of western coal fields. An appeal was made to NCLAT against the order of CCI, and NCLAT put a stay on the order of CCI and ordered the appellant to deposit a sum equal to 10% of the total penalty. The appellant was unable to pay the amount required, and then the NCLAT dismissed the appeal on the ground of non- compliance of stay – order provided to the appellant. The appellant appealed to Supreme Court against the decision of NCLAT. The Supreme Court in its judgment stated that there is no condition precedent such as payment of a penalty to be fulfilled for entertaining an appeal. The provision regarding the appeal is mentioned in section 53b of the competition act. The appeal must be entertained after hearing both the parties that are following the principles of natural justice (audi alterm partem). And not only by fulfilling the compliance of stay order provided by NCLAT. The application was dismissed by the NCLT on the sole argument that the agreement in question was a “pure and simple agreement of sale and purchase of a piece of property” and the status of a financial debt has not been acquired as the transaction does not have consideration for the time value of money. on 04.01.2018, the order passed by the Bankruptcy Court approving a resolution plan for Kamineni Steel & Power was struck down by the National Company Law Appellate Tribunal (NCLAT) as the said company had failed to receive the mandatory 75 per cent vote share, a pre-requite according to the Insolvency and Bankruptcy Code (IBC) to get the plan endorsed by the court. The NCLT and NCLAT are constituted to provide justice. The powers vested in NCLAT and NCLT should be used in a fair way and should act diligently while dealing with any of the cases. The fundamental principle of law that is the principle of natural justice must be adhered to by every courts and tribunal so that miscarriage of justice does not take place.